Osun United currently campaigns in the southern conference of Nigeria National League NNL, the league that adopted abridged format where the two finest teams from each group will eventually play in the elite division next term. The host enjoyed a massive support from their vociferous fans from the start, to the end of the game. 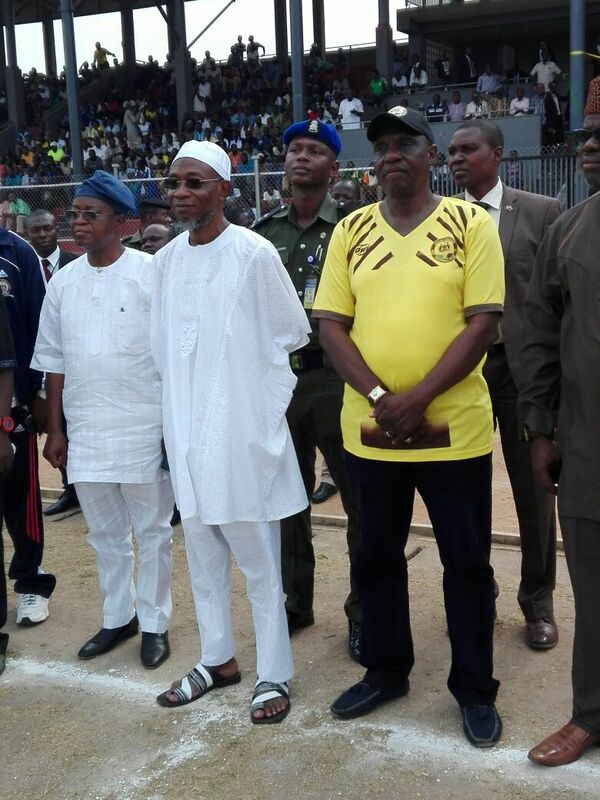 The presence of the number one citizen of the state, Ogbeni Rauf Adesoji Aregbesola was no doubt a morale booster for the lads. Although, United gaffer, Duke Udi, had earlier psyched up his lads to douse the seemingly looming pressure by focusing on the game and never to be overwhelmed. Of a truth, Osun United fans have been yearning for the commencement of the league, owing to the massive turnout recorded. The attacking trio of Damola Fakayode, Adeyeye Adeyemi and former defunct COD FC of Lagos pacy forward, Omoyele Tosin looked promising. The two goals scored were masterminded by the trio. ‘Believe and Achieve’ gladiators were spoilt of quality personnel upfront with the addition of former Sunshine Stars goal poacher, Lekan Agunloye who did not even dressed up for the game and Aleem Adebayo to the squad. With the exploits of these strikers, Osun United should record appreciable numbers of goals in the current NNL season. The intent is clear and this must send a signal to their subsequent opponents. As good as that team was, it merely papers over the cracks that are still there at lnsurance. Although they had a Slim win over My people FC in week one encounter over the weekend, but until that 2nd goal goes in, there is still a real fear that they could register a leveller. Ukeme, Okai and Monday were culprit as they failed to open up the partnership of Kehinde Adeyemi and Emmanuel Osigwe in defence of Osun United. Their head coach, Roland Ewere was smart enough to identify various lapses as he promised to improve on his squad for the next game. One of the most talked about player at Osun United. He is also one of the most consistent players Duke Udi has at his disposal. United benefitted from his goal scoring prowess last season, he was able to register 6 goals in the league and additional 3 goals in federations cup. Former Crown FC man was fed with a tasty ‘nod’ by Omoyele and he wasted no time to power in the half volley in 12th minute. His second goal came via the spot kick in 32nd minute. Opponents should therefore watch out for this guy. At the blast of the final whistle, Duke Udi was not available to grant the post match interview, due to some reasons, but his assistant faced the press to hail the unbiased officiating, this was also corroborated by visiting head coach, Roland Ewere. Post match interview is part of Udi’s job, he should endeavor to observe it next time. Some fans were heard shouting UP PRIME! relentlessly not minding the fact that the name ‘PRIME FC’ has been re-adjusted. Engineer Rauf Adesoji Aregbesola, approved the re-adjustment last year, to create community identity, and supporters’ followership. Osun United is the name of the team now and not ‘defunct’ Prime.